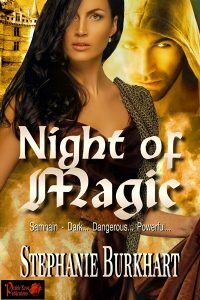 Night of Magic…Samhain—Dark…Dangerous…Powerful…The year is 800 A.D. on the Emerald Isle, and Prince Jasper is determined to regain that which has been lost to him. Five years past, Princess Aithne was taken from her father, Prince Jasper, by the forces of the Other World. On Samhain, the veil between the worlds is thin, and can be breeched more readily—especially if one walks amid the ceremonial bonfires.